Royal Huisman has teamed up with renowned designer German Frers for Sea Eagle, a 43.31 metre sailing yacht is designed to allow her Taiwanese owner to cruise the world and compete in the odd regatta. 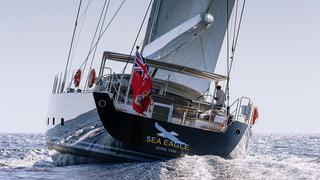 One of our favourite features of Sea Eagle is that she's built to win races. Sea Eagle has a high-aspect carbon fibre mast that towers 57 metres above the water and carries upwind over 1,000 square metres of standing sail. With well-positioned sightlines from the twin helm stations and an adjoining cockpit, the crew are given a commanding view. Royal Huisman has teamed up with renowned designer German Frers for Sea Eagle, a 43.31 metre sailing yacht is designed to allow her Taiwanese owner to cruise the world and compete in the odd regatta. One of our favourite features of Sea Eagle is that she's built to win races. Sea Eagle has a high-aspect carbon fibre mast that towers 57 metres above the water and carries upwind over 1,000 square metres of standing sail. With well-positioned sightlines from the twin helm stations and an adjoining cockpit, the crew are given a commanding view. Whilst Sea Eagle is expected to put in a good showing at regattas, she has been engineered to be a comfortable vessel to cruise in. Her vast social spaces are an important part of this, ensuring guests stay connected whether underway or at anchor. The unique awning-covered tea deck and dining area on Sea Eagle is a great spot for outdoor dining or relaxation in the shaded seating area. 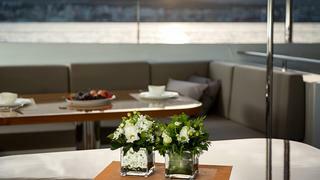 And inside, the deckhouse comprises of a dining table and sofas to allow all guests to interact whether dining or lounging on board. Whilst Sea Eagle is expected to put in a good showing at regattas, she has been engineered to be a comfortable vessel to cruise in. Her vast social spaces are an important part of this, ensuring guests stay connected whether underway or at anchor. The unique awning-covered tea deck and dining area on Sea Eagle is a great spot for outdoor dining or relaxation in the shaded seating area. And inside, the deckhouse comprises of a dining table and sofas to allow all guests to interact whether dining or lounging on board. 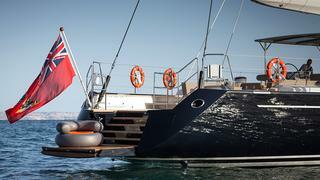 The finest superyachts offer a sense of fun, and Sea Eagle does this well with her beach deck. Two steps lower than the main deck, this beach deck boasts comfortable seating and a coffee table, where guests can relax and soak up the sun. Aft lies the transom, which opens out to reveal a large swim platform and full-beam staircase enabling a fun packed day on the water. The area can be used as the idea launch pad for a day of fun in the water, once the 5.2 metre jet tender is deployed from the transom garage. The finest superyachts offer a sense of fun, and Sea Eagle does this well with her beach deck. Two steps lower than the main deck, this beach deck boasts comfortable seating and a coffee table, where guests can relax and soak up the sun. Aft lies the transom, which opens out to reveal a large swim platform and full-beam staircase enabling a fun packed day on the water. The area can be used as the idea launch pad for a day of fun in the water, once the 5.2 metre jet tender is deployed from the transom garage. Of course, comfort is as important as performance and her easy living interior design, by Rhoades Young, provides just that. A sophisticated ambience is created throughout Sea Eagle, thanks to her combination of white oak floors, upholstered wall panels and birch wood accents on the backdrop of french walnut. The spacious deckhouse, which features a cosy conversation zone and dining area for guests, is flooded with natural light thanks to large wrap-around windows. The spiral staircase at the aft that leads below to two guest cabins and the owner's suite. The expansive realm for Sea Eagle's owner has its own entrance to the stern beach deck. Like all Royal Huisman yachts, close attention was paid to reducing noise and vibration to library-like levels even when the engines and generators are in full operation for a smooth and quiet ride. Of course, comfort is as important as performance and her easy living interior design, by Rhoades Young, provides just that. A sophisticated ambience is created throughout Sea Eagle, thanks to her combination of white oak floors, upholstered wall panels and birch wood accents on the backdrop of french walnut. The spacious deckhouse, which features a cosy conversation zone and dining area for guests, is flooded with natural light thanks to large wrap-around windows. The spiral staircase at the aft that leads below to two guest cabins and the owner's suite. 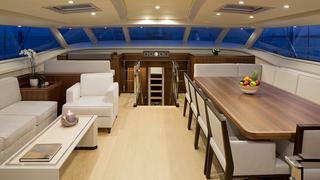 The expansive realm for Sea Eagle's owner has its own entrance to the stern beach deck. Like all Royal Huisman yachts, close attention was paid to reducing noise and vibration to library-like levels even when the engines and generators are in full operation for a smooth and quiet ride.